Master a whole new frame of mind to increase your focus, motivation, drive, and career with biohacking! Ever wonder why that one overly-motivated friend of yours is always so successful at making money? Some people just have everything they need in the mental department, but what about the rest of us? We have all seen the movie starring Bradley Cooper. Unfortunately, there is no magic tablet that will bring you instant success, but there are things you can do to trick your body into that mindset and honestly feel like you have never felt before! As a health and fitness enthusiast, I have tried a lot of medications and supplements in the past, but it wasn't until I started using biohacking to literally hack my biology and mind into, truly, becoming limitless in all areas of my life. I became super motivated and driven. I started making more money as a forex trader after experiencing a huge increase in my passion and focus. Over the past couple years I've learned a TON and this book brings it all together for me to share with you! 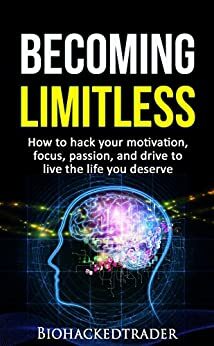 You will learn to use diet, exercise, sleep, habit formation techniques, supplementation, nootropics, and a few helpful life and biology hacks with the ultimate goal to make you more productive in your work and life. This quote fits perfectly with what I am trying to accomplish by providing you with this wealth of knowledge. After only a month he was seeing his hard work pay off and finally controlling the mental side of why he was failing over and over again. Using diet to change how your body and mind function. How to work an easy exercise and sleep routine into your overall daily schedule. HABIT FORMATION and how to stick with the new habits you've made for yourself! Daily vitamin and mineral supplementation specifically for improving the mind. Finally conquering issues like ADHD, Depression, Anxiety, and Hormone Imbalances. NOOTROPICS along with how and when to properly use them. SIMPLE and CHEAP lifestyle hacks to make the whole process a bit easier. How to gain more of an entrepreneurial mindset. Most self-help books out there never address the biological issues involved in bettering your life. Unfortunately, positive affirmations and the "Law Of Attraction" won't get you very far. Your personal biology and the chemicals in your head are 90% of what is stopping you from changing your life. 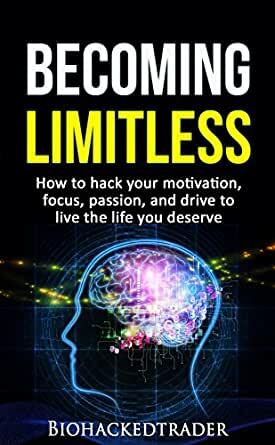 This book covers topics that can help you to become a machine at accomplishing tasks and improving your overall "work/life balance", but the part most people struggle with is the formation of new habits and not giving up. This is why I have tailored each chapter with that goal in mind and we address why people give up and how you can get around the mental struggles of a new routine. If you have seen the movies out there and think it's impossible to become that advanced of a human being, you're wrong. I can't promise you will master the stock market in a day or learn a new language in a week, but this book will give you the tools and the motivation to at least want to try! Learn why it has been so difficult for you and finally get to where you want to be and have it finally "click"! 5.0 out of 5 starsGreat Book!!! One of the best self improvement books you will read! It'll help you change your habits completely and you'll In turn have better ones. It's a steal cause it focuses on so many levels of self improvement. Diet, supplements, habits, sleep, and much more. I'm surprised more people haven't read it yet, it's a gem! great read! this has helped me redirect my focus and pursue a change of lifestyle. the advice is much more sensible and realistic than some of the garbage self-help material out there. Complete waste of time, and money. First off, there were several and I repeat, several mistakes in the book. The author must have not even taken the time to spellcheck it when he wrote it on microsoft word. For some reason I was under the impression that the book was a lengthy one, but then I received it only to find out it had like 89 pages. Half of the stuff is just repetitive. If he used a normal sized font like most books do, and took out the repeated stuff, this book would be about 30 pages. Everything I read I already knew. Most of this stuff you can find out through a simple google search of "Biohacking for beginners". It is written in a sort of "bro science" way, which really allows you to feel how very little the author even knows on this subject. I would not purchase this book, only god knows how it had positive ratings, he probably payed someone to leave a good review. 5.0 out of 5 starsConfidence booster! This book really helped me become more motivated and confident.